Buying a good drinking water test kit can be an important decision for you and your family’s health. Testing your water is also a wise investment if you are looking into purchasing a home water filter system. Knowing what is in your water will help to determine the best filtration media for your specific needs, especially when certain contaminants, such as lead and fluoride, require specific media for filtration. The choice is fairly simple. I believe National Testing Laboratories (NTL) provides the most reliable and comprehensive water test kits at affordable prices. This company also has a comprehensive list of ISO/ISE certifications. Whether your water comes from a municipal water source (city water) or from a private well, NTL has kits for testing both types of source water. Even though municipal water treatment facilities test the water after it has been treated at the facility, the water then is distributed throughout the city or region through miles of pipes. Unfortunately, many of the city’s pipes are old and contain copper and lead and other contaminants. In addition, when the old pipes start to crack or leak, the water then becomes vulnerable to many other types of contaminants in the soil. Homeowners who rely on private wells know that it is their responsibility to test the well water regularly to make sure it is safe for consumption. In most cases, most wells are treated and then tested only for bacteria. And even though water contaminated with bacteria can cause acute illness, other contaminants in ground water that contain contaminants such as arsenic or uranium can, over time, cause more serious illness, even cancer. National Testing Laboratories has been in business for over 25 years. 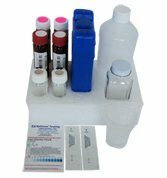 They offer the basic water test kits for both city water and well water, as well as numerous products for testing for specific contaminants. After you send your water sample to National Testing Laboratories, you will get the results with 10-14 days. Once processed, you will receive an email with your report. Likewise, the well water test kits have a range of options. If you just want a basic test to see if your current water treatment or water softener is working properly, you could get the Watercheck 1 & 2 Kit (about $100+), which checks for 22 heavy metals and minerals (including arsenic, lead and mercury), 7 inorganic chemicals (including nitrate and chloride) and 5 physical factors that include hardness, pH and alkalinity. Other well water testing kits include the Wellcheck, the Watercheck, and the Watercheck with Pesticide. Prices range from about $140 to $220. NTL offers a wide array of quick water tests and tests for specific contaminants, including lead, iron, radon, uranimum and fluoride. Click here to see all of the NTL Drinking Water Test Kits.